03 President’s Message: A tease of the upcoming IWGS annual meeting in France. 05 Plant Pick: Gianluca Bonomo describes the basic facts about Nymphaea ‘Manee Red’. 06 Grower’s Corner: Growing waterlilies for the flower trade. 08 Expert Corner: Mike Gannon shares the fun of finding tadpoles in your water garden. 10 A New Water Garden: The new Glenstone Museum water garden is a central part of the art collection. 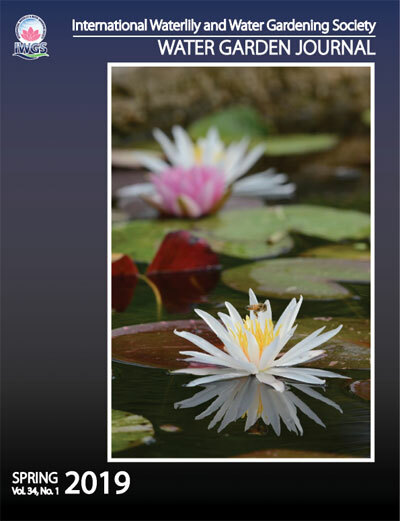 14 Plant Research: Pang U Bon staff outline advances in breeding miniature waterlilies. 18 Event Preview: A preview of the Macao Lotus Flower Festival. 20 Club Report: Zijun Li and Xuli Chen introduce the Chinese Waterlily Enthusiast League. 22 Plant Research: Dr. Richard Jobson, a botanist from the Royal Botanic Garden Sydney, recently discovered a brand-new water plant species. 23 Event Calendar: Upcoming water gardening events. To view this journal, please click on the link for the 2019 WGJ Vol 34-1 journal in the row listing.